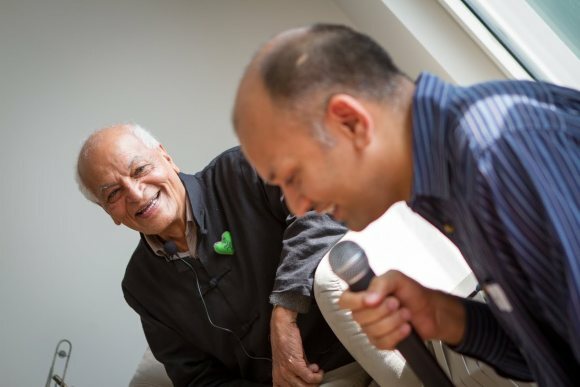 Satish Kumar: Nipun and I had a dialogue about meditation and medicine [during the break]. These two words come from the same root in Latin, and so meditation or medicine both mean pay attention. When you pay attention to your body it becomes medicine. When you pay attention to your mind, spirit, inner world - it becomes meditation. And meditation is not only when you sit cross-legged, closed eyes, for half an hour to one hour every morning. That's a good practice every day, but that could extend throughout the day. Here you have lots of quotes on mindful living -- that is to pay attention to everything you do. From eating to sleeping, even SLEEP mindfully! Everything including walking, talking, speaking, thinking... be aware of the state of your mind. That is meditation. So meditation is 24 hours. It's a delightful occasion that Nipun wrote to me, and I have seen and met Nipun many times, so it's a great pleasure to be with you. Thank you for contacting me. Nipun Mehta: Thank you, and thank you all. When I realised I was going to be in town, I had emailed Satish. I had this one day I am here and that just so happens to be the one day that he's here too! Originally, we were going to meet for lunch but then I thought that it would be rather selfish of me to take his time all by myself. :) So we thought that we would just dialogue where I'll prompt him with a couple of questions, and then open it to Q&A with all of us. More broadly, such events aren't meant to deliver inspiration. We're going to inspire each other. It's a co-created process, whether you're cooking or cleaning or fixing this or holding the mic or listening. These are all just different roles. We are actually co-creating a space. We're all consumers and we are all producers and that's the mindset with which we hold this space. With that in mind, let me introduce Satish-ji. In India, we add a "ji" suffix, as a sign of respect. Satish has had a remarkable journey. I remember reading about him many moons ago, and I was like, "What? Really! Is there a person like this?" At 9, he's selected as a leader of this particular Jain community. He becomes a monk, and at 18 leaves that community to serve the world. Usually you do all this work first, with aspirations of becoming a monk some day. His journey, though, went the other way. "I need to go out and serve," he said and he then connects with Vinoba Bhave. At one point, he reads the paper and he sees Bertrand Russell, who's 90 at the time, get sent to jail for standing for peace. He asks, "What do I stand for? I've got to do something." He ends up walking. All the way, from India to the United States (except for this Bering Strait patch). You know - do not try at home! And he did it without money, purely on the kindness of strangers. I don't know how many people alive could tell you that they've walked 8,000 miles in this way across all those different countries. Satish became an ambassador for peace. Since 1973, he's editor of Resurgence magazine and he has been a visionary behind Schumacher College. He's actually done a lot of things. Millions of people know his work around the world. Satish-ji, it is an honour that you would accept this invitation to be amongst friends and I would love to invite you to share a little bit about your journey as a first question. Trishna read one of your articles recently and essentially said, "Oh my goodness. He is really inspiring!" So I asked her what stood out for her in reading about your journey, and she said, "Growing up Jain, there was this idea that you graduate to become a monk and work on your inner transformation, and here was an example of someone who is chosen at a young age to be leader of religious community, and by 18, he is saying that actually it is through service that I am going to progress." I was wondering if you could share a little bit about your initial journey and ultimately how that led to your walk. What is that process of going outside to go within, as opposed to going within to go outside. SK: Thank you. As a Jain monk, there was a wonderful foundation for my life because in Jain studies you learn about nonviolence, ahimsa. And nonviolence not only not to kill animals or not to hit somebody, but nonviolence of mind, nonviolence of thought, nonviolence of speech, nonviolence to yourself. So, there is a wonderful foundation, but it was a very personal nonviolence. At age 18, I was given a copy of Mahatma's Gandhi's autobiography, called My Experiments with Truth. Mahatma Gandhi was very influenced by Jains, one of his great teachers was Shrimad Rajchandra, so Gandhi is a kind of Jain, his mother was Jain. And so he says that practicing spirituality in personal life is wonderful, but that's not enough. You don't have to forsake the world to practice nonviolence and spirituality. You have to be IN the world, and BEING nonviolence, spirituality, ethics, and all the kinds of wonderful things that monks practice in personal life, in the world of politics, in the world of business, in the world of economics because not everybody can become a monk. And spirituality should not be exclusive to monks, it should be inclusive to everybody. We all need to live spiritually. Not just the monks. So, how do you bring spirituality into everyday life, in business, in your politics, in your education and your farming and your cooking - whatever you do. That was such an eye-opening message for me. I said, "Wow, spirituality in everyday life. I want to do that!" And so Gandhi did. Gandhi brought spirituality an nonviolence in politics, into everything, as you know his story. And so I decided to, not leave Jain principles, not leave Jain ideals or values but to leave the Jain institution, the format, and so I decided to bring myself into the world. And another very important line by Mahatma Gandhi is that you cannot change the world. You can change yourself. Be the change that you want to see in the world - it's a very famous line of Mahatma Gandhi. You can serve the world, and through service, the world may change, but do not expect. Do not think that you are the great leader and you will change the world. Change yourself, and serve the world. And when you serve the world, the world may change, or may not change - you do not desire any results of your action. You just serve, service itself is it's own reward. They were the two things - spirituality in everyday life and changing yourself and serving the world. Those were the key points of Gandhi that I really felt were inspiring. And so I left the monkhood, and joined a Gandhian Ashram. How do you do politics or business or economics or farming, spiritually? By changing your motivation. Why you do business that you do? Why are you in politics? You go not for your ego satisfaction. Not for your name, fame, status, power, control, money, wealth - nothing! As I said, you go in politics to serve, you go in business to serve, you do farming to serve. You do it with pleasure, not for status, not for power. By changing your motivation, you make your actions spiritual. A prime minister can be a spiritual being if the prime minister is not there for ego, bubble of this self-centered ego, "I am great and I want power." So everything can become spiritual, by changing your motivation. That was a kind of inspiration that led me to the rest of my life. NM: You started with this remarkable first step. In your early years of just going on this walking pilgrimage. It's a very radical idea, to walk and to do it without money. What inspired you to do it without money, and money now increasingly is becoming a very dicey issue. So what insights would you have on the role of money itself, and in that process of doing something like this [pilgrimage] without it? SK: As Nipun said, I read one day, sitting in a café in Bangalore, that Bertrand Russell at aged 90 had been imprisoned because he was protesting against the nuclear weapons. I was with a friend called E P Menon. "Look! Read this!" And he read it. I said, "Here is a man of 90 going to jail for peace in the world. What are we doing young men here, 25, 26, drinking coffee? This is not right. We should do something for peace." So that was the inspiration. I wrote a book called No Destination: Autobiography of a Pilgrim, you might like to get a copy, but in a nutshell we decided that let's go to four nuclear capitals of the world - Moscow, Paris, London, Washington D.C.- and protest against the bomb. And if we go by plane or car or train or any other means, nobody is going to take any notice. But if we walk to these capitals then we will get media interest, and it will be of interest to other people, universities, churches, mosques, public. So let's walk. And having walked for 9 years as a Jain monk - walking was no big deal for me. And so we went to see Vinoba, who was our teacher, our mentor, we were working with him, and he was very happy. He said, "I give you my blessings." But then he said, "You are going for peace in the world. Wars begin in fear. Peace begins in trust. How do you show that you trust? How do you show that you are not only talking about peace, but being peace? One way to be peace, is to go to these four nuclear capitals, walking without any money." And it was a little bit of a shock. (Laughter). I said, "Vinoba, without any money? Sometimes you might need a cup of tea or something." He said, "Not any money and have no fear. The universe will look after you. Have no fear! You don't know how you will be looked after, I won't know, but go without money." That was a wonderful idea and advice, so I dropped all my money, as did my friend, the both of us. We started from the great Mahatma Gandhi['s grave] and we went through India first. And when we came at the border of India and Pakistan, the first time we are leaving India, and going to Pakistan. That was the last day in India, so all our friends and supporters and colleagues and family members all came to say goodbye. And one of my very dear friends, Kranti, she said, "Satish, aren't you crazy? You're going to Pakistan, our enemy country! We've had three wars between India and Pakistan over Kashmir, and you are going without money, without food, and by walking. What about your safety? At least you take some food with you." She wanted to give us money as well, but at least take some food with you. Packets of delicious food-smelling. But I remembered Vinoba, and I said to her, "These packets of food, are not packets of food. They are packets of mistrust. What am I going to say to Pakistani hosts and people, that I did not trust whether you will feed us or not? So we have brought our own food all the way from India." She started to cry. I said, "Kranti, why are you crying? You are not going! (Laughter) I am going, and you are crying?" She said, "Satish, this might be our last meeting, because you are going to be in Muslim countries, Christian countries, capitalist countries, communist countries, mountains, deserts, forests, wild, everything, walking without money and without food. I don't know if I'll see you again." I said, "Kranti, Vinoba has said the fear, you have to drop, and so I am dropping my fear of death. If I die while walking for peace, that's the best kind of death I can have. And if I don't get food, I'll say this is my opportunity to fast. My mother used to do 'atthai' (to give up food and water or only food continuously for eight days), we can do 'atthai' - 8 days without eating and my mother was fine. And if I don't have shelter to sleep, I'll sleep under the stars and I'll call it a million star hotel. So, that's how I went for two and a half years, in those countries with unknown languages, unknown people. Don't know what is going to happen tonight, whether I would get food tonight, whether I would get shelter tonight. Every day. Not one day, not two days, two and a half years totally dependent on other people, but totally spontaneous. Everything, what in modern science they say 'emergence.' It was emergence. Hospitality was an emergent property. Every day, more or less, I mean there were a few days where I went hungry fasting. There were few days when I slept under the million star hotel. There were few days when I felt a bullet. There were few days when people would not give me shelter. All those difficulties were fine. And those difficulties made me even stronger. I welcomed difficulties. I said that if I was old with lots of money and staying in hotels and everything was fine, that would not be the adventure. Walking for peace is that adventure. That taking risk and living in faith and peace and trust. That is the greatest. So I walked around the world and I met Bertrand Russell, I met Martin Luther King, I went to the White House, I went to the Kremlin, I went to 10 Downing Street. Newspapers, media - everywhere. It was amazing. It was wonderful to do that without money. When you have money, nothing. It's too safe, too easy, too cushioned. But with no money, and you can live because, who will need money to help? Air? But without air, we cannot live for 1 minute. It's free! Water? It's free! I mean, you don't have to buy bottled water, rainwater is free. So air, water, soil is free! Soil is our biggest food. Food is not coming from Tesco or Sainsbury's or big companies. Food comes from soil, and soil doesn't say you have to pay with your VISA card or credit card. When I was born, I did not have PhD. I did not have a job. I did not have any education. How did universe put that delicious, nourishing milk in the breast of my mother? Out of blue! Before my birth there was no milk, and the moment I was born there's milk. Where it came from? So Universe provides everything. We have to trust the universe, and we have to trust our imagination. We have to trust our creativity. We have to trust our hands. We put our seeds in the ground, we have to serve the Earth. We have to serve each other. Mother looks after you, you look after the mother. Your wife looks after you, you look after your wife. You look after each other. Money is only a kind of medium of exchange. I was just saying to Atul and to Sudhir in the car, I said that money should have a sell-by date. Like a credit card has an expiry date. Your checkbook has an expiry date. After one year your check is no longer valid. So money should not be permanent value. There should be an expiry date. After 10 years, that particular amount of money is defunct. If you've not used it, then why are you holding it? Money is only to flow. Just use it, spend it! And you'll have more money, if you need it, like a new credit card, a new VISA card. So money should have a sell-by date. And you can live without money. You can. If you live a simple life. NM: What was really curious and interesting, is how Vinoba responded after you did all this. You visited Heads of States, went to the White House and 10 Downing Street, and then you go back to your teacher, who had given you this idea -- this Gandhian idea of not using any money. What was Vinoba's response, and what was the learning there? SK: I mean, he was delighted, and even Kranti. When I arrived back in India, Kranti came to meet me on the port in Mumbai and she was delighted. And Vinoba was very delighted and he said that,"It's good that you went. Ultimately you don't need to go anywhere to make peace in the world if you meditate on peace and everybody meditated on peace, wherever they are. And trust each other, and there will be no war." So, Vinoba's idea is this idea of division, that you are separate from somebody else, is the cause of our fear. Fear comes because you are the other. Whereas if you have an idea of relationship, you are with the other. I wrote a book called You Are Therefore I Am and I am delighted that Thich Nhat Hanh has done a calligraphy of "You Are Therefore I Am." Vinoba's idea was that we are all related. So this idea that the American national interest is separate from the Russian national interest, or India's national interest is different from Pakistan's national interest, or Hindu national interest is different from Muslim national interest, or religious interest, or any other. This separation is the cause of fear. If you want no fear, then you have to say we are all related, we are one humanity. Whether you are American or Russian or Buddhist or Hindu or Jain or Muslim, or black or white - under the skin you have a red blood. We are all red blooded. We are all one. We are all members of human community, and ultimately we are members of earth community. So, that was Vinoba's response, that the peace comes from trust and dropping fear. And that trust comes when you say, we are all one, unity of life, and then manifesting that unity in millions of forms and faces and shapes and so on. So diversity is complementary to unity, or you can say, unity dances through diversity. So, diversity should not be perceived as division. Diversity should be perceived as a dance of unity. And celebration of diversity -- it is wonderful to have many languages, many nations, many colors, many religions, many philosophies - that's a kind of Jain idea of 'Anekāntavāda', 'anekant' meaning no one truth. Truth diversity, like biodiversity, culture diversity, religious diversity, even truth diversity. There's no one single truth, which I can hold and say this is my truth and this is the only truth. We have our own truth. Everybody has their own truth. You see, our common ground is nonviolence. You do no harm to me. I do no harm to you. That's our common ground. If we can have that common ground, without fear, then we can have peace in the world. The separation causes fear. NM: What do you think, when you look at the world today and its tremendous poverty, strife and suffering that people are facing? How do you stay hopeful in such a world? How do you stay true to this idea of unity, when everything is systematically designed to create that separation? Politicians, for example, separate because they want to get elected -- because people like that kind of a narrow story. You can draw that narrative across every single sector. So in presence of that, in presence of the ripples of suffering that that causes, how do you stay grounded in optimism? Your presence is very optimistic. And there's a lot of people who do this work that end up going on the other side and burning out. Yet you're 79, you had an event yesterday, you're still here today. And instead of just having a quiet lunch, you're opting to do this today. So what is the source of your optimism and enthusiasm? Clearly there is some regenerative resource, while science is telling us there's empathy fatigue or compassion fatigue. It seems to me that you are coming from a space that is significantly different. Can you shed some light on that? SK: First of all, we need to have a perspective. And perspective is that yes, there is a war, but out of seven billion people on this Earth, how many people are engaged in war? One million, two million, five million, ten million, twenty million? Not even that. The other six point whatever billion people on the Earth are not at war. They are farming, they making pots, they are building houses, they are looking after children, they are teaching, they are nursing, they are doctors, they are doing their business. They are living peacefully. So this idea that war is the only reality in the world is not reality, just because newspapers write about war and conflict. If you are looking at your life twenty four hours a day, how many hours you are angry? And how many times, how many hours, you are loving and caring and getting on with your life in a good way? Maybe one hour you are angry, or half an hour, or two hours. But what about 22 hours or 23 hours, when you are loving and kind and compassionate and doing poetry and making pictures or cooking beautiful food, or cleaning the house or working somewhere or bicycling? We live more peacefully in the world. And so we have to believe that perspective, don't just believe the newspapers. Believe your own experience. I would say that humanity, at large, is good. Humanity, at large, is spiritual. Humanity, at large, is compassionate. And the lack of compassion - wars, conflicts, fights - are aberration. Maybe sometimes I get headache. I get sometimes flu. I get sometimes tummy upset. That's normal. Normal state of my being is healthy. Occasionally I get ill, so I don't say, oh all my life is illness. No. Occasionally I get ill, so there are healing processes. You have reconciliation, you have service, you have Mother Teresa, you have Mahatma Gandhi, you have Martin Luther King, you have Nelson Mandela. These are doctors, healers. Jesus Christ, St Francis... the Pope is a good news. (Laughter) Yes, and in our Britain, Jeremy Corbyn is a good news. And in United States, Bernie Sanders is a good news. There are people who are serving the society, who are taking care of the poor. 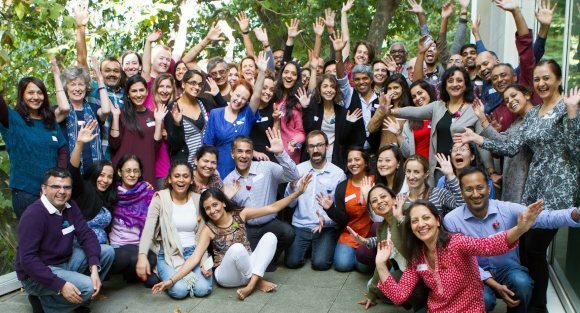 They are working for transformation, working for holistic health, working for environment, working for Friends of the Earth, Greenpeace, WWF. People are living without money. Service is there, like doctors healing. So we have healers, and we need healers all the time. We can never have utopia. Like in our bodies you cannot guarantee that you will never fall ill, or you will never have headache or you will never have some cold or cough or flu. That's part of natural being, but that is a minority. The majority is we are spiritual beings, we are in good health, we look after each other, and if something goes wrong we have doctors, we have healers, we have servants - like Mahatma Gandhi, Mother Teresa. And all of you. And him (pointing to Nipun) (laughter). Yes he is in that class because of his wonderful service to the world. So we need such healers all the time in the future. There's no time when you can say it's a utopia and all the problems are solved, there will be no war, no poverty, no illness - that is not possible. We are humans, and humans means dark and light go together, complementing each other. So negative and positive go together. So any problem in the world, we will always be there to heal. We will always be there to serve. We will always be there to look after each other. We cannot guarantee that there will be peace everywhere in the world. But wherever there is war, we will go there to build reconciliation, serve the society. That keeps me optimistic, that keeps me energized. Until the last breath of my life, I will be there to serve. And then will be a new generation. Alex is new leader, he is Action for Happiness. And many of you I am sure are involved in the work of service. That is the source of optimism and the source of enthusiasm and source of energy for me. Question: How do we fight the war against culture, wisdom and heritage? SK: It is a difficult question because, as Atul said, we are under the tsunami of materialism and this world kind of dominance, where we are told that ego, greed, money, control, power are the kind of goals of human life. That these are the aims, we have to aim for money, success, power, control. These are a kind of tsunami of materialism. It's a real real problem. Now, only way to deal with it is to work on a small scale. Sometimes big problems need small solutions. We cannot, overnight, turn around and say globalization will come to an end. But, we can start small projects, and many many many small projects can gather together and create a dual energy. And so our challenge at this time is to create positive, constructive projects where people are engaged, and where people, even in the mainstream society, see that there are alternatives. And those alternatives are already starting. In Britain, there are farmers' markets, there are small communities, there are some permaculture projects, there are some crafts, there are some fair trade. Many many big projects are starting and so we need to encourage them, we need to promote them, we need to support them. So with just a few exceptional examples of idealistic individuals doing some good thing, it becomes more and more mainstream. And when the grassroots has changed then the top cannot be sustained. The top is sustained only because of the grassroots. People are voting with their feet and supporting those big institutions, big materialism and the lack of culture. There is a difference between civilization and culture. Culture, the word, originally used to be connected to the soil. Cultivating. 'Agri-culture', cultivating the soil. That was the original [meaning], if you read your Oxford Dictionary or somewhere, you will see 'culture' was the soil. And then civilization came from 'civic', which is the city. So what happened is that culture became backward. If you are agriculturists, if you are living on the land, cultivating the land, you are undeveloped. You are backward. If you come to live in the city - London, New York, Mumbai - have money and don't make your hands dirty. Because hands dirty, dirty - wash it with your soap. But dirt is not dirty! Dirt is the source of the Earth, soil is the source of the food. And so the way to bring that culture back is all of us need to go back into nature. We need to work in nature. If you have a space here (pointing to terrace), you could put some plants, some herbs. With sun there you can grow something, even in the city, a city like London. Or you can have an allotment. So if you want to build a culture then you need to touch the soil and be connected to nature and the environment. Like you cultivated the soil, you also need to cultivate the soul, and to cultivate the soul you need meditation, you need music, you need art, you need poetry, you need dance. You need something that is beyond material possession and accumulation of goods and stuff. And so cultivating your soul, cultivating your imagination, that's a kind of corollary from cultivating the soil. So if more and more people say, I'm not going to work five days a week. I'm not going to work from 8am in a bank and work in the city until 8pm. Lots of people in the city and in banks work from 8am to 8pm, twelve hours. I'm going to negotiate with my employers, I'm going to work only three days a week, or two days a week, or four days a week - whatever suits you. Why we should have only Saturday, Sunday? And actually even some people don't have free time on Saturday or Sunday. So, have three-day weekends, four-day weekends, and have that time for your own arts, crafts, music, poetry, meditations, spirituality, family, friendship, gardening, walking, seeing if you can live a human life. That's the way to answer the globalization problem, the tsunami of materialism. If we do not change ourselves, we cannot change the world. That's what Mahatma Gandhi said. So we have to be who we really want to be - be human beings and not just human doings, or human havings, but human beings. That's the answer to your question. Question: I have a question about fear. Very briefly, I've left work and I've decided to hopefully go and help children in Peru. That's something I'd like to do. I've worked in the high tech industry for over 30 years, done like everybody else has done, and I find myself being fearful sometimes about the particular choice that I've made. How am I going to live, without earning any money? I don't know. I'm going to give it a go, but I wonder how you manage to really get around that fear? What advice would you give me? When I dwell on that fear, I know it's not real but sometimes it feels very real. SK: You are going to live the rest of your life beautifully and well by giving yourself to Peru, or to society, or to community in whatever way. When you give yourself, the universe works in reciprocity. Everything is reciprocal. When you give, you receive. So just give! Give your time, give your love, give your talent, give your hands, give your work - whatever you have. And in your body you have everything! You have nothing you lack. Fear comes when you feel, "Oh, I lack something." You don't lack anything. You are a Gandhi. You are a Jesus Christ. You are a Shakespeare. You are a Picasso. You are anything you want to be. Your potential, your consciousness, your imagination, your creativity is boundless. There's no limit to it! So why are you worried? Just go to Peru. Put yourself in the service of the people, and they will look after you, have no fear. Universe has produced you here in this little body of five foot or six foot. In this little body. universe has put in you the entire universe. You have the sun, you have the moon, you have the stars, you have the imagination, you have the spirituality, you have the creativity. Why are you afraid? You don't need money. If you needed money, universe would have put it in your body. But you need imagination, you need compassion, you need creativity. And you have it all. Just use them. Give yourself to the service of humanity, and the people, and the Earth. And Earth will give you back, humanity will give you back. How did Jesus live? How did Buddha live? Buddha was emperor! He had elephants, he had servants, he had everything! But he gave up everything. And he went to Peru! (Laughter) So you are living in England, an emperor. You have a house, you have money, you have a car, you have everything here. You are giving up, like the Buddha, and going to the forest. Go. Don't worry. All will be well. Question: I'm also wondering about fear. I was wondering if fear gives us any gifts? SK: You need a bit of fear. When fear becomes overwhelming and controlling you, then it becomes a problem. But a little bit of cautiousness, a little bit of awareness, it's like salt and pepper on your food. You need a bit of caution. So my formula, it's not so much fear, but living in the presence gives you less fear. So have about 10% of your life thinking and living in the past. Only about 10%, approximately. And then 15% in the future - a bit of planning, where you are going and what you are going to do. But 75% of your attention is to pay attention in the present moment. So, 75% of your time, and your attention, and your presence should be in the present moment. Present is the greatest present that you can have. That is why it is called present. So live now, and that will reduce your fear. Fear is over-thinking a lot of the future. How am I going to survive? If I get ill, I will need to have insurance. If I lose this or lose a job. All the fears in the future. The present moment, very little fear. So a little bit of salt and pepper is OK, but don't be overwhelmed by it. Question: The population is around seven billion, but the food being produced in the world is enough to feed nine billion. What is going on that I don't understand. SK: What is going on. One is selfishness. We are all just concerned about ourselves and we don't think. The other is waste. If you take waste - how much food is wasted in Britain. There are food banks, where people don't have food so they go to food banks, but huge amount of food is wasted in our refrigerators, in our freezers, in supermarkets, where the sell-by date is gone and therefore food is thrown away, in transportation. So waste is a big problem, and a lack of organization A lack of compassion is the other problem, because when you become selfish you are less compassionate. When you have compassion, then you share. So you are absolutely right, there is no lack of food. It's a lack of organization. And therefore each and everyone of us, individually, we have to say, "I will not waste any food. I will not waste food in my refrigerator or freezer." In my childhood, we had some of our land and we grew food and many things in our land but if we needed vegetables, every morning we'd go to this market, a farmers' market type and buy fresh vegetables. Vegetables picked that morning, and we'd bring it and cook it that day. And next day fresh vegetables for that day. Today, wrap everything. Plastic. Put them in the freezer. Put them in the fridge. Electricity bill wasted, and that food goes waste because it's not fresh and we don't like it. Throw it away. So idea of a organization is a culprit. And waste is culprit. And then selfishness, not caring for others, culprit. So we need to start changing our own personal lives, and then share that concern with others. Communicate that concern with others and other people by your example will also be influenced and will waste less. Then, food is left to be shared. That's how we can do it. Question: I'm very interested in the role that technology has to play in our culture. When you talk about nature and the need to connect with nature, I feel there is a very human aspect to that often gets lost in the obsession with scalability and processing that technology allows us to have. We talk about wrapping food up and sticking it in the fridge, that electricity comes from a power station somewhere far away. That fridge was made in China, the food was produced somewhere else and then wrapped by someone else and then brought to my fridge. This is all about these massive scalability processes. Given the obsession that technology has with achieving scalability, how do we flip that on it's head and use it to change it's focus to help solve within micro communities instead of solving at this global level? SK: I think it's a very big question. Our tendency is to make things complicated, whereas sometimes simple answers are the real answers. But we sometimes have this human tendency in modern times to make things complicated. So the real genius is to make things simple, and as you said yourself, in a micro community. If we had smaller scale and our cities were slightly re-designed where nature and culture were not alienated from each other, and nature not put into exile but nature was in the city. And we could also grow our food and we could walk to our workplace. We could live a more healthy and micro community lifestyle, rather than importing food from thousands of miles away. At the moment our minds are conditioned. We are brainwashed to think that technology will solve all the problems, globalization will solve all the problems, somebody will solve the problems. big company will solve the problems. This kind of brainwashing has been going on, and our education teaches us that as well. The media does the same thing, and government does the same thing. So we need to shift that conditioning of the mind, this brain washing, and say globalization - or the big corporations, the multinationals, the transnationals - they are not going to solve the problems. We have to create our own micro communities where we can live simple but elegant lifestyle. Elegant simplicity. Simplicity does not mean that you have starvation or hunger or a kind of misery - no community and no food and no clothes. No no. You make something beautifully, but elegant simplicity at the micro community level. We can create that and we can re-design our cities to bring nature into the cities. Also around the city, within say thirty to forty mile radius of London, there should be food - milk, butter, grain, vegetables, whatever we can grow. That should come like Covent Garden market used to have fifty years ago, where local farmers brought the food in the morning, three o'clock, four o'clock in the morning and everything came. So that could be the store. It was there. It was only about the last twenty or thirty years that we have become so globalized that local markets and micro communities have become destroyed. So we can restore them back. This kind of system is only about, at most a hundred or two hundred years old - this kind of very civilized, urbanized system. And globalization is even shorter. It's a human-made system, and as John F. Kennedy said, "What is made by humans, can be changed by humans." So we need to take power back in our hands. And we need to say, we are going to be somebody else, creating a solution to the problem. I'm going to be the leader. You are the leader. Each and every one of us are the leaders. We can begin to create a new form of life, which is more sustainable. More enjoyable, more elegant, more simple - not complicated, and less wasteful! Waste of energy, waste of electricity, waste of food, waste of many many good things that we have. We waste them. We can create a new life. Question: This aspect of cultivating the soul, you talked of certain activities, being with nature, music, poetry... The work I do in the city is to help people find a stillness. And what I find with regularity, almost with a clinical certainty, is the one door that people don't open is to do with intimacy. And so of course there is 'Vipassana', which is an external caused discipline, and there is mindfulness that is now in vogue. But the inherent nature of intimacy has been suppressed for ages. The Buddha was a prince and of course he kind of transcended, and for many others that walked that path. But for the common man, for the man who is fighting, paying a mortgage and has a family, children, sitting silently eventually raises up even more pain. I wonder, what is your guidance and perspective that you could share? SK: I think you have touched upon a very beautiful word - intimacy. And at the moment, in our society, we are living such a life where there is very little time for intimacy. Even we don't see our children so much as we need to, or should be seeing. Even we don't see our beloved husband or wife, as much as we need to see them. We don't see our parents, which are intimate family relationships. Friendship, we meet for dinner or something like that, but not enough. So if we can restore intimacy, then I think many of our alienation, depression, mental problems, breakdown of families, breakdown of marriages, all those things can be addressed if we can develop intimacy. So to have intimacy you need time. Meanwhile our society at the moment is so work orientated, and that work is not really work but it's a work just to get money. Sitting behind a computer, behind a desk, doing paperwork, that's no human work, but it brings you money. We have become kind of work slaves, and we work so much from morning to evening, five days a week, six days a week, that we have no time for intimacy. And so we have become money rich, but time poor. And time poverty leads to intimacy poverty, so we are poor in our relationships. You have touched on a very important subject - intimacy. We don't have time for ourselves. There's no intimacy for our own selves, we are always externally orientated - one more telephone call, one more email, one more this, one more that. Outside - forgotten our own intimacy to be intimate to ourselves. Where is time for your own walk? Or have a nice meal with your wife or husband? Or a little play with your child, and just be happy and contented within yourself? Do a bit of yoga, meditation - read a book. Even a beautiful novel like Siddhartha! Have you read the Siddhartha novel? Beautiful novel. So something which is inspiring, time for yourself. Holiday should become a holy-day, and not just a kind of week away from bank and then just come back to it. And even there you have iPad or an iPhone or something. So that intimacy is destroyed by this very busy work, work-slavery almost. We are, loads of us, sort of glorified slaves of work. No? Question: Is it possible that, because there is no intimacy, there is an attention on work? SK: No, I would say the other way around. There is too much work, and attention to success - external success and power, and status. So much attention there that we have lost intimacy. So we need to shift, a little bit withdraw. from this egotistical pursuit of more money, more power, bigger car, bigger house, bigger name, bigger status. Whatever fame, whatever you are seeking, if you withdraw from there, in order to have a moment and space for intimacy. You don't need to do anything for intimacy, you just need to have time - there's no other effort needed. But for success and power and fame and name and all of these things you need to do work. But for intimacy, just BE! Just be yourself. Be. Question: You touched on something, which broaches on the field of work I am in, which is spending 70-90% doing future planning in the world of money. And for fifteen years I have been on a path of financial freedom. Our children have gone on their own prospective paths. Something you said about having a finite line, a finite time, where money becomes redundant or needs to be spent that resulted in quite a stare from my wife - so I have potential destitute after this. Can you just give me a little bit perspective on what you mean of draw a line, I think I understand but I'm not sure. SK: There is no fixed line that someone can draw for everybody. You have to have a question for your heart. And say, what is my line? Where should I draw my line? Each and every one of us have different circumstances. You cannot make one rule for everybody. But have you got time to ask that question to yourself? That is the point I am making. In your meditation, ask, what is it that I want? Who am I? Who am I? What do I really want? Do I want love? Or I want work? Do I want compassion? Or want money? Am I a CEO of a big company. or am I a human being? Who am I? Who am I? Ask that question! What is my line? You have your own heart and your heart is wise. There is wisdom, within you - innate wisdom. And that will come the answer. Your inner voice, your still inner voice is the real guide. Your inner blue is the real blue, when it's blue outside. Each candle has a light, isn't it? Just take a few matches and the light will be lit there in the candle. So your own candle, you have to ask that question, what is my line? Who am I? What is my purpose? What is my meaning? How do I want to live? Do I want more fame, more power, more position, more house, more car, more computer, more this or that? Or I want peace, quiet, relationship, family, friends. Of course we all have to work. But within a limit, how much you want to work? What kind of work you want to do? Do only what you love doing. That is your only touchstone. Only do what you love doing. Or love whatever you are doing. If you don't love it, give it away. Don't fear. Give it up, if you don't love doing what you are doing. Your human life is so precious and you are wasting it doing something you don't love doing! I'm talking to you now - I love talking! (Laughter) If I didn't like it I would walk away. So don't do anything which you don't love or enjoy doing. Do everything with pleasure. When you make a cup of tea for me, do it with pleasure. And when I thank you, you are likely to say, "I did it with pleasure." Do whatever you are doing, with pleasure. Enjoy it! 'Ananda' is the Sanskirt word for it. Ananda, ultimate 'Sat-cit-ānanda.' Ananda is the ultimate word. Shivananda. Yogananda. Everybody gets -ananda at the end of their name when we become a spiritual person. When you do yoga, don't do yoga with no ananda in it. Even yoga is not good without ananda. So yoga has to be ananda. Yogananda. So ask yourself, nobody else can answer for you. Your inner guru is within you. Your inner voice is within you. And you get the answer. You won't be stuck. And then you are serving life. And live your life according to your own wisdom, not according to some guru or some famous Krishnamurti or Shivananda or Satish Kumar - none of that. Your own guru! Your inner guru. Ask that question and you will find the answer. Question: As a twenty-two year old I have a vision of my life to live a very fulfilled life and be of service to others. But on the other side I have a vision of a career and making money. My question is, is there a balance to keep with both those journeys? Is there a set line to keep? Or is it something only I can decide? It's just a confusing space. On one side there's a lot of pressure on career and business but on the other side there's the spiritual journey. Is that something you can combine? SK: No separation. You can combine. But as I said at the very beginning of the talk, do your business to serve. Not for your own career, but to serve. And while you are doing business to serve, money is coming. Money is only a means to an end. So do not do to make money - anything. The purpose of your life is not to build a career. What is career? You become CEO, so what? There are thousands or hundreds and thousands of CEOs in the world. So what? You are a unique being. You are very special being. What is your specialty in this world which nobody else has? Bring that out. There's only one Picasso. There's only one Shakespeare. There's only one - what's your name? Ashish. There's only one Ashish. Be Ashish. Be yourself. And then money is your servant. Money comes. I'm not against money. Nipun might be. (Laughter). I'm not against money. I'm against you focusing on money rather than yourself. So let the money come to serve you. But you don't serve money. Let the money come, if it wants to come. But you are here to do something greater. Twenty-two! Wonderful life in front of you. Just be something which your children and the history can say, "Ashish did that! Wonderful! Ashish has worked. He's built a cathedral." Cathedral's a metaphor. (Laughter). Some kind of building. Build a cathedral, metaphorically. Do something and then money will pour. There will be no shortage of money in the world. Billions and billions of dollars and pounds go around the world without any purpose. They are looking for something good to do. There is no shortage of money. Money is only an idea. Money is only a figure in the bank account. Money is only a figure on the computer screen. There's nothing real about money. There's something real about you. You have body. You have hands. You have imagination. You have mind. You have soul. You have spirit. You have love. You have compassion. You have relationship. You have everything! You are forgetting all of that and you are looking for career and somebody will call you CEO or somebody will you call you director or somebody will call you president or chairman. What is that? It's only a word. You are more important than anything else. Take care of yourself and offer yourself in the service of the Earth and the humanity so that Earth and humanity remembers you forever. Be a Buddha! You are a Buddha. Be a Gandhi. Be a Shakespeare. Be a cathedral builder. You have potential. Your consciousness is a potential, but that potential is kind of buried. Unfold that potential, unleash that potential. You are amazing, every one of you. There's a saying in India, given by Ananda Coomaraswamy, that an artist is not a special kind of person, but every person is a special kind of artist. So you are an artist. You are a poet. Poet is not only somebody who picks beautiful words on a page. Poet - Poiesis. The word poiesis means "to make". Whatever you make, if you make with imagination, with creativity, with your heart, with your love, with your presence. Anything you do is a poetry, so be a poet, be an artist, be a cathedral builder, be something with who you are one and the money will flow. There's no shortage of money. For Mahatma Gandhi there was no shortage of money even though he lived in a hut, billionaires were writing checks for him. (Laughter) So money will come. I've never had any shortage of money. I went around the world. You want to go around the world you can say, "Oh I have no money, how can I go around the world"? You don't need money to go around the world! You need imagination, you need courage, you need determination. Cultivate those qualities, money will be at your service, at your feet. Millions and millions will come to you. How did the great Sadhus get those temples built? Where did money come from? Volunteers! People come behind you. I want to do something! So there will be no shortage of money, but don't go for it. Money should be a shadow following you, not you following your shadow. Question: I have a question about service. We have this idea of one service being better than another service. Almost like a hierarchy of this is what doing good means to the world and we should pursue that, and if you're not doing that then it's not worth it. And I guess as a young person if you're not trying to create like a tech start up, or the next Facebook then don't start it. It's pointless. This idea of hierarchy of service. What are your thoughts on that? SK: There's no real hierarchy of service. The true service is the kind of service which speaks to your heart, what service you feel when you do, your heart says, 'Yes! This is what I want to do". Your heart should speak to you. Nobody else can tell you do this or do that. This is better service than that one. Nobody. If animals appeal to you, look after animals. If forest appeals to you, look after it. If the poor people appeal to you, go and work for the poor. If old and sick dying appeal to you, go and work for the old and dying. If independence of a country, like India - Mahatma Gandhi's appeal was, do that. Go and work for your government or for independence or for a political party. Whatever appeals to your heart! So you have to ask yourself, "What is it which appeals to me? What is it which my heart speaks to me, and I feel good about it? And I enjoy it! And I don't feel any burden." Service should not be a burden. Service should not be forced. Service should emerge out of your compassion, out of your heart, out of your empathy, out of your love. Where you don't want to do anything other than that, that is real service. There's no hierarchy - what you do, just do it. Question: If it's not natural to be living a very materialistic lifestyle, why is the majority of the world doing it? SK: Because of our conditioning of the mind. From childhood, we are told day after day, week after week, year after year by our parents and then by our society, and then education! From age five to twenty, nearly fifteen years you are pushed through a very narrow line that you have to pass the exams and get good degree, to get a good job, so that you get good salary, so that you get a good pension, so that you die. (Laughter). Narrow and straight line. Mind is conditioned and brainwashed. Everybody is just following the same path. You go to school. You go to university. You get a degree. You get a job. You get a pension. You get a few holidays. Then you die. So the way to break out of it is for each and every individual to take control of their lives. And say, "I'm not going to follow the trodden path. I'm going to make my own path. I'm going to make my own life. How I want to live". And there are many good examples of people that have broken out of it. Many many good examples. I mean Krishnamurti was brought up from childhood to be the prophet. And one day he realized, I don't want to be a prophet! I want to be an ordinary human being, and he renounced. I was brought up to be a monk. I could've lived there forever. But one day, matches from Mahatma Gandhi and my own light came to me, and I said, "I don't want to be restricted in this monastic order. I want to bring this spirituality, this nonviolence, into the world." That's a true Jain idea for me. So you, or anyone of us can have that moment where we can say, "I'm going to be courageous! I'm not going to follow the trodden path". That's all we can do. Our conditioning of the mind is so strong. Education, parents, colleagues, peer group - everybody is telling you to be successful, in terms of money, job and career. That conditioning has to be broken. OK thank you for all your questions. NM: We had a tentative hand that just went up. I always try to pay attention to the tentative hand. Question: Ok, just to follow on from that. There's fear in that as well of taking your own path and not being on the trodden path. Because when the majority are potentially on that other path of success, career, money etc etc. Then also at the cost of potential intimacy because I am so connected to friends, family etc and the attachments of people that are following the other path. it's a potential to feel lonely if you then go on your own trodden path, which is different to that majority. How do you get over that? SK: That's a fear. A fear that I might get isolated, that other people may not like me. And my parents may not like me, and my friends may not like me. And they might say, why are you doing this? You must follow the path! That's a fear. And the moment you do it. The moment you take your own path. Parents will say, "Wow! What a daughter I have. Wonderful. Amazing what you are doing You are doing such a wonderful thing". But they don't know what you are going to do and so they want to see you safe, they want to see you secured, they want to see that you've got a good life, you've got a good house and everything. They want safety, but you don't want safety. You want something courageous. You want something extraordinary, but they don't know it. And then you have fear, that if I do something, what I want to do - my parents won't like it, my husband won't like it, my children won't like it, my friends won't like it - so you don't do it. So that kind of insecurity imposes fear. My advice would be, listen to your heart. Do what you really want to do. In my case, my mother didn't like me going around the world. (Laughter). She didn't like it. Without money - she was very afraid. I said, "Mother. I'll get back. Don't worry". And then when I came back, well while I was on my journey, my guru, Acharya Tulsi, who was a Jain guru, he praised me to my mother. And said, your son is really being a Jain sadhu. He's going on foot, and without money - begging, like sadhu's do. Isn't it amazing? Other sadhus don't go to America and Moscow and so on. And my mother said, "Wow, is it my son that is being praised by my guru?" And then she came to me when I came back and said, "Oh you did a wonderful thing!" But when I was beginning, she was afraid because she wanted security. She wanted me to get married, to have children, to have a house. How am I going to do this journey without money, only walking. What is going to happen to it? So they are afraid. But you need to have your courage, and do what you want to do, and then world will praise you. I guarantee you, I can give you a written paper. I guarantee the world will praise you if you do what you really want to do with courage and imagination and creativity through your own heart. NM: To conclude, I'm going to give you one last question related to that. I was looking at my cousin Simi over there and she just became a mother, with a wonderful young one named Ashleen. What advice would you have for a mother, and ultimately I think we are all sort of mothers birthing so many new possibilities. How do you think we can tend to that in a responsible way that supports us, that supports those around us and supports society? SK: First of all I want to say, Simi, that every mother is a hero. Bearing a child in your womb, for nine months. When I have a little suitcase in my hand I want somebody to help me. You are carrying the baby! And then you go through that labor pain, great sacred motherhood - sacrifice of the mother, to bring that child into the world. It's a heroic, heroic journey, a heroic act. Every mother - mothers are unsung heroes. You think every woman gives birth to child, so what? It's not ordinary - it's extraordinary. And so whether you are a woman or man, we need to respect that. And don't think that giving birth to a child has to be in the newspapers or has to be praised or something. It doesn't need anything. Just the act of being a mother. And my mother was a hero. She was my greatest teachers. When you ask me, who was your greatest teacher? My guru Acharya Tulsi or Vinoba Bhave or Bertrand Russell or Martin Luther King, or you have Schumacher - I would say my mother was the greatest teacher. Nobody gave me so much understanding of wisdom of the world as my mother did, from childhood. And so motherhood is the most wonderful, the most precious, the most creative, the most imaginative, the most greatest poetry, the greatest art. Can anybody create an art, you can have a stone sculptor, Anthony Caponi or somebody - but it's not living! Every mother is creating a living sculptor to bring this beautiful body, this human body, with imagination, creativity, soul, spirit, poetry, art, service - everything in this body, mother is creating it. Mother is the real sculptor. Mother is the real artist. So I sing the songs of praise to all mothers. Be a good mother. Give freedom to your child. Children come through you not from you. So when the child is out in the world, give your love. Give your care as long as the child lives. But give them freedom. Safety is not the primary concern. Difficulties are welcomed, problems are welcomed. When children go through difficult times, they become stronger. If you plant a tree in the greenhouse, it will never be so strong. The tree has to be out in the field, under the storm, under the sun, under the rain - all the kinds of difficulty, then the tree will be strong. So give your child that freedom, where the child is out there. They come through you but not from you. They have their own thoughts. They have their own destiny. They have their own creativity. Don't control it. So motherhood is wonderful but real mother is mother who gives freedom to children. NM: That's beautiful. Let's take a moment of silence in gratitude. I think we all feel like clapping but I feel like being even more sacred and going to a deeper place of appreciating our space and deepening our resolve to live these values. To be the change. So maybe we can take a minute of silence in that spirit. Thank you for co-creating this space this morning. Satish-ji, how can words thank you. But I will say thank you anyway. Lovely! Thank you Liam. Feeling the energy just reading it. Much gratitude to all of you. Thank you Liam !! So wonderful to read and absorb these gems through the transcript. Thank you Liam, what you did is just amazing! And you've made many of us very happy - now we can read (and re-read!) the incredible dialogue we were privileged to hear in person. Thank you so much for doing this and sharing it with all of us! SK's words clearly come from Soil, Soul and Society (and I don't mean the book!). Bowing to this wisdom.